It’s not often we get to witness the inner workings of the American justice system. Unless you’re a judge, attorney, or just someone that has had one too many brushes with law enforcement, most Americans don’t usually get to witness the nitty gritty of our legal practices. On the rare occasions when we do, it seems everyone not only has an opinion, but a strong one (read: Zimmerman, Casey Anthony, OJ Simpson). We debate and react with outrage when we feel our justice system was not quite… just. Sadly it’s usually the cases that are not broadcasted 24/7 on CNN and FOX that tend to fall through the cracks. It’s the impoverished, the youth, the victims of crimes and domestic abuse, the immigrants… those are the ones that are forced to navigate an unfair justice system first hand. The travesty of justice can only get worse when suffered by the voiceless. As an immigration attorney, we see this first hand with immigrants put in removal proceedings, separated from family for weeks and months with no hope for relief. As passionate immigration attorneys, oftentimes we are the only ones that are able to advocate for this voiceless segment of our society. Those are the cases that pull at our heart strings the most. Today, I attended a hearing in Immigration Court in a small “town” called Lumpkin, Georgia – about 145 miles from Atlanta, where even the cows don’t graze. If you make the trip out there be sure to check your tires and fill your gas tank. 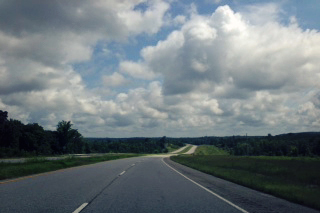 It would be easy to get lost in the miles of nothing. Except for the prison where the Immigration Court is housed, there are no other landmarks in Lumpkin. You know you’re getting close when your cell phone completely loses service, although that’s fine – no one is permitted to bring a cell phone into the building anyway. 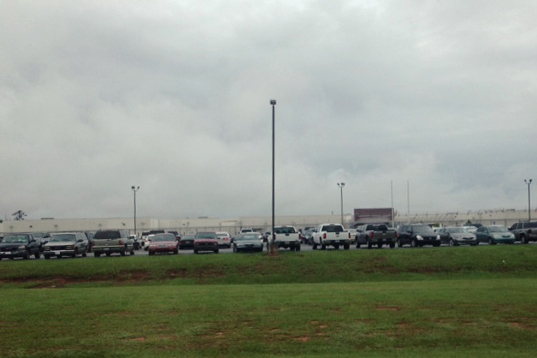 The Stewart Detention Center stands side by side with the Stewart Immigration Court. On average the detention center houses 1,497 detainees daily – more than the entire population of the city itself. 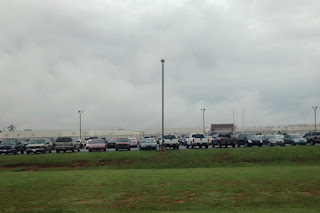 The Detention Center is owned by Corrections Corporation of America (CCA) – the largest private corrections company in the United States, housing approximately 75,000 offenders and detainees in its more than 60 facilities. The building intimidates immediately – canopies of razor sharp barbed wire and double locked doors greet you as you enter. As an attorney appearing on behalf of a client in Court, it can still take 20 minutes just to fill out the forms and go through security – and that’s if no one is in line ahead of you (otherwise you’d have to wait outside – where more than likely, it will rain). You may think that these public hearings are public, hence the name, but the many security guards remind you that one cannot simply walk to a courtroom – you have to wait until the Judge calls you in. You must be invited. Once your work before the Court is done, you’re just as quickly uninvited. Communicating with your client is a challenge in and of itself. You cannot speak to your client when you are called into court or after the hearing concludes – this is the time for the Judge to speak to you. Most of the time, you are not allowed the courtesy of communicating with the government attorney. Since it is virtually impossible to communicate with your client by phone, you really only have one option: you can opt to make the three-hour drive to visit them during visiting hours and try and talk to them through a static-laden handset while attempting to peer at their documents through a cloudy glass wall. As one can imagine, preparing for hearings can be challenging. But as challenging as it can be, the detainees that can afford attorneys are actually the lucky ones. Countless detainees exhausted from endless days in top security detention center with no end in sight and no money to hire an attorney soon learn that the fastest way out is to request an order of removal. Many choose to leave knowing full well they are forgoing potential relief available to them in our immigration laws that would allow them to stay here, but simply do not have the know-how to navigate a complex legal system. Many cannot afford to hire a lawyer, particularly because many charge a premium for cases in Stewart because they have to take a whole day off just to appear for a 10 minute hearing. Even those with means have a hard time finding a qualified attorney, because many attorneys shy away from representing detainees there. Many attorneys’ offices are simply not equipped to handle the unpredictability of scheduling and subsequent long absences, or they themselves are not familiar with the intricacies involved in representing detainees in fast-paced removal proceedings. In civil proceedings, we are not afforded government-appointed counsel. In these cases however, a “public defender” will actually save tax payers from having to detain non-criminal immigrants that could be monitored via cheaper, alternate methods like an ankle bracelet. Further, in cases where there is an actual avenue for relief, appointed counsel can help speed up the process, benefiting all involved. An attorney can also assist in those cases where there is just no relief available – advising the detainee to request an order or removal (or voluntary departure) and saving them from weeks and months of false hope. Due process is a fundamental right guaranteed by the United States Constitution. It acts as a safeguard from arbitrary denial of life, liberty or property by the government outside the sanction of law. The U.S. constitution is not limited to U.S. citizens. It’s not even limited to only those who do not commit heinous crimes. If a mass murderer is guaranteed due process, then what do we have to say for the hard working, tax paying father of four U.S. citizens, who has made America his home for 20 years that gets arrested for driving while unlicensed and put in removal proceedings with no real access to representation? How can we explain to his children that the freedoms guaranteed to all of us by our Constitution are actually not for all? Are these the American values that we stand proudly behind? Yes, it’s easy to get caught up with all the hype surrounding the high-profile cases that make the news every evening, but it’s the low-profile cases that do not make it that we should be the most concerned about. Those are the ones that slowly but surely erode at our fundamental rights to due process, tear families apart, and eventually harm the rest of us too. It’s time to speak up and voice our opposition to our representatives. The time is now. Travesty of justice starts with the small threads, quickly unraveling all the stiches of our justice system until we no longer have a beautiful quilt – but instead a pile of rags. That was beautifully written and really helps others understand some of the frustrations of a broken immigration system. As the wife of a man who was deported on June 19th after being in Stewart for nearly three months, I can attest to the terrible conditions that limit the detainees' access to ANYTHING, much less representation. I tried, to no avail, to find an attorney to take my husband's case and was told over and over again that they did not take on cases at Stewart. The government definitely knows how to alienate the detainees – to get them away from society to a place where they are all but forgotten. From the lack of access to medical care, no hot water, clogged plumbing, and even a dispute between CCA and Western Union that prevented money being sent to the detainees for over three weeks to denying visitation privileges to family members who show up in sleeveless shirts, the treatments of the detainees is inexcusable. ICE and DHS claims they are detainees and not criminals, yet Stewart is classified as a medium-security facility and visitors are subjected to the dual-concertina-wire-topped fence completely surrounding the facility and the double security gates that they have to be buzzed through.